Breanne taught warm-up class at 11:30. We all were able to sleep in due to the later performance... really nice! We left the studio in two cars. Ashley in one, and everyone else in the other car. A little ways down James St. I realized that I hadn't put the Mother India(MI) props in the car and soon found out that no one did. We forgot them! So Ashley continued onto the church while we turned around. Breanne and I retrieved the props which were hiding... So off we were to the the church and right about the same place on James St. we realized we didn't have the Lifesong streamers- so back to the studio... haha... that will never happen again! We soon met up at Northside and went straight to setting up. The Hope Network is a ministry that offers support for families with children who have special needs. We actually performed for the Hope Club(inside Hope Network) which is a social network for teens and adults with disabilities. It was great to meet some of the people as we were setting up. One lady was helping Ashley with the sound :). We performed MI, Lifesong, and Won't Turn Back. It was wonderful being in a larger space... so nice to move! There were some mess-ups here and there in the dancing, but overall it went really well. After we performed they came up to try some dance steps. The did really well! We had to move out pretty quickly after it was all over-quick strike- because Ashley had to teach. Lord, may you continue to shine through every movement and smile as we dance! Today we performed "You are Special" at Word of Life Christian Academy in Baldwinsville. I always enjoy our performances at Word of Life. The audiences are always so encouraging. I know that they are continually lifting us up in prayer. What a blessing!!! Today's performance went well...up until the point when Ashley and Rachel both tripped over the dot and star box. Rachel covered up well by scolding the star box for being in her way (it fits right into her role as the scholarly Suzie :-), and Ashley's character is pretty clumsy so tripping over the dot box fit in quite well for her also. Our next improv challenge came during the part of the scene when Lucia comes out on stage to hold a stick for the limbo competition. As I was pulled out on stage, I glanced around looking for the stick, only to realize that it was nowhere to be found. So, my arm was dubbed the new limbo stick :-) It worked out alright...my only fear was that my arm or head might be injured as I held it out for dancers to jump over. Thank you Jesus, both arm and head are intact! 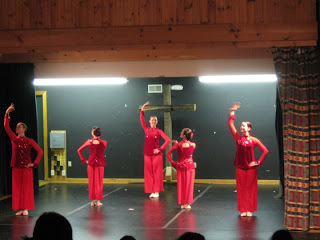 We performed for the Hispanic Women's Retreat in Lake Champion, NY. After having class and a quick rehearsal we all piled into the van along with Mr. & Mrs. Rollinson and Deborah, Rachel's sister who was visiting. It was a tight fit and there were a few 'interesting' seats but we all fit! It was a 3 1/2 hr drive through the NY countryside with some beautiful scenery. We arrived at the retreat center and set up, we were able to have more space on the stage then we originally thought which was really good. After getting everything ready we had some time to spare so we walked around the lake and took pictures, it was so beautiful and peaceful there! 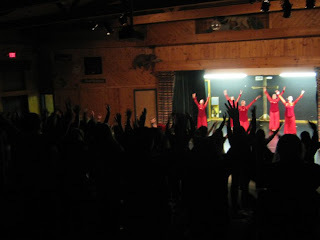 We performed Alive, Lifesongs and our new Spanish Dances.There were about 60 Hispanic women and a few younger girls as well; the majority of them did not speak much English. They especially loved our Spanish dances, which were really fun to do! :) Mr. & Mrs. Rollinson introduced Lifesongs, Ashley closed the program and I shared my testimony. For all the speaking we had an interpreter and everything went very well. For our last song, we did simple arm movements to I Surrender All, the songs stared in English and then switched to Spanish and we had the ladies join us. It was a really powerful time of worship and so beautiful to see the women stepping out of their comfort zone and worshipping the Lord in a new way. After that we were available to pray with people and many ladies came up for prayer. There were a lot of prayer requests for healing and family members. I was able to talk with a group of young girls, and encourage and pray for them. We were blessed by the prayers of some of the ladies and the encouraging words spoken to us. They were so touched by our coming and by what the Lord did. After striking we ate a nice dinner that they provided and then headed back to Syracuse at 9:40pm, we arrived back at the studio at 1:20am after a long but fruitful day. I feel so privileged to be used by God to share His love with others! It was a nice early morning... 5:45 for most and even some 5:30 AM. After a warm-up at the studio we headed over to Parkside. We slightly lost each other in the 'following car' process. Thankfully we all pretty much knew to get there. Our changing room was the 'boys room'. Our performing area was a big gym without heat... it was pretty cold! We actually had 2 performances at Parkside- 9:30 and 12:00. This was our first performance with Skip and Jason for the year. So in piled the kids with their teachers. Allot of them had mental disabilities, so there were almost as many teachers as kids. Kelli C.'s cousin William was there... he works with the kids. During our performing there was always some noise or movement with the kids. I heard from a teacher that her kids were talking the whole time and they loved it! I pray that the kids really remember the message that 'You are Special'. The actual performing went great! We had some last minute changes due to no 'cocky boy' character... but everyone did really well! After we had the kids try some moves and they loved it! Especially the jumping up and down and spinning. In between performances we went into a spare classroom and talked. We had a fun time reminiscing over past things. Ashley told us how she and Hannah B. first met... hilarious story! I found out that my sister, Deborah, would be coming the next week for her spring break! I was ecstatic!!! Lord, I pray that you would bring to remembrance the message of how we are each special, to these children! Saturday, March 6th Light of the World got to perform at the Carousel Mall, right here in Syracuse, NY! This was very exciting for all of us, as we have been praying over the mall for some time now. Breanne and Rachel both work there. It was great to be able to perform there and proclaim the name of Jesus in this dark place. We even got to perform right in front of where Breanne and Rachel work! We performed Life Songs and the Ballet level 5 from the school performed their version of won't turn back. The performance was for a "Family Times" fair, and Light of the World even had a booth and got to promote our summer camps coming up. Unfortunately, I have been out with an injury this week, and although it was so hard for me not be dancing it was still fun to be able to watch the other girls dance and to intercede while they are dancing. I did help with sound too, so I didn't feel completely useless! But it was also nice to see the dances from a different perspective. And they all did such a good job! We had excellent responses from the people watching, and there were even people looking down from the levels above. Even the Ballet 5s did their piece very well. It was a joy to have them there with us. It still seems unbelievable that we were able to perform at the mall, because we have been praying for it for so long. It just goes to show you that God is faithful. What a great God we serve! This past Sunday we performed Alive, Mother India, and Won't Turn Back for Word Of Life Assembly Of God children's ministry. We met at the studio to warm up at 7am and arrived at the church by 8:30am. Once we arrived at the church we loaded everything up into the elevator and then started our set up process. The stage was fairly large but an unusual shape. After setting up, Light Of The World joined the VIP devotions where Breanne lead. After devotions children started arriving and we started our performance shortly after a baptism. The performance itself went well. The floor was pretty squishy for pointe but that's okay! Alyssa C. shared her testimony and found out afterward that what she had said was exactly what a specific child needed to hear. This was not what she had planned on sharing but was definitely what God wanted her to share! Ashley was also able to share the salvation message. After the performance we had children come up and try dance moves. That is always fun! We were able to talk with many children afterward. The director of children's ministries was very encouraging to us by sharing what a blessing our ministry has been to her.